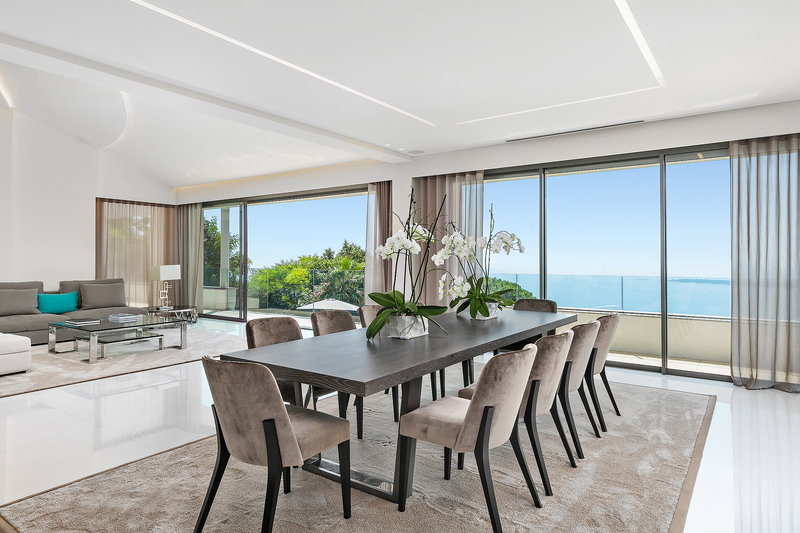 CAR1275 is a luxury 5-bedroom holiday villa is located in Super Cannes, one of the most prestigious neighbourhoods in the city. The magnificent modern property is set in beautiful private grounds and surrounded by rolling hills overlooking the Mediterranean. The property is stylishly decorated in a contemporary style, the spacious villa can accommodate up to 10 guests comfortably. The bedrooms are split over the villa’s 3 floors with ensuite facilities, whilst the first floor living space comprises a double reception room with a large lounge area and dining room plus a fully equipped kitchen. On the garden level you’ll find a wonderful summer kitchen and living room with direct access to the patio and stunning infinity pool. The property is situated in an ideal location in the exclusive and secluded Super Cannes. 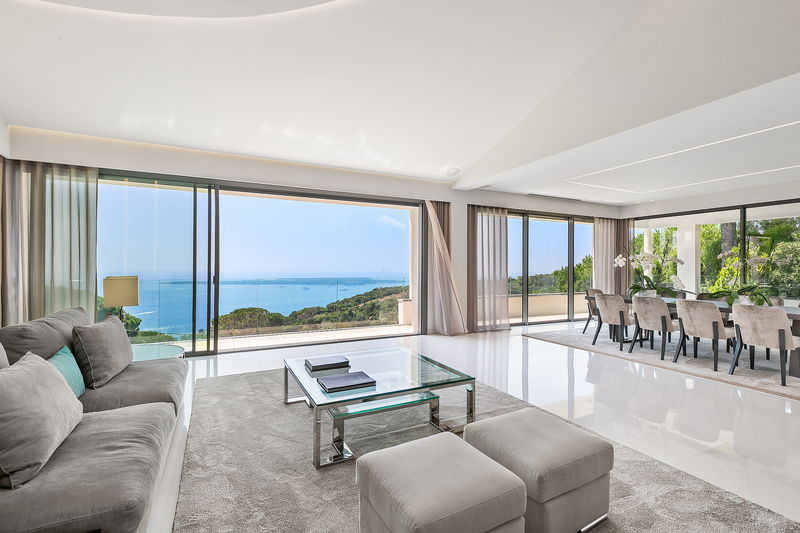 The holiday villa is just minutes away from the city centre, boasting Cannes’ gourmet restaurant scene, luxury boutiques along the Croisette and glamorous private beaches. Elegantly designed and beautifully decorated, this sumptuous villa is a sophisticated and luxurious home away from home. Floor to ceiling sliding doors throughout create a seamless transition between the indoor and outdoor living spaces while the rich marble and wood interiors perfectly complement the chic white and stone exterior. The main living space is flooded with light and offers guests fabulous views of the garden and pool area from the villa’s wrap-around terrace while the bedrooms all open onto a private sundeck or terrace. The main living space is situated on the first floor of the villa. The spacious lounge is decorated in soft neutral tones and has a comfortable seating area grouped around a large flat-screen television. 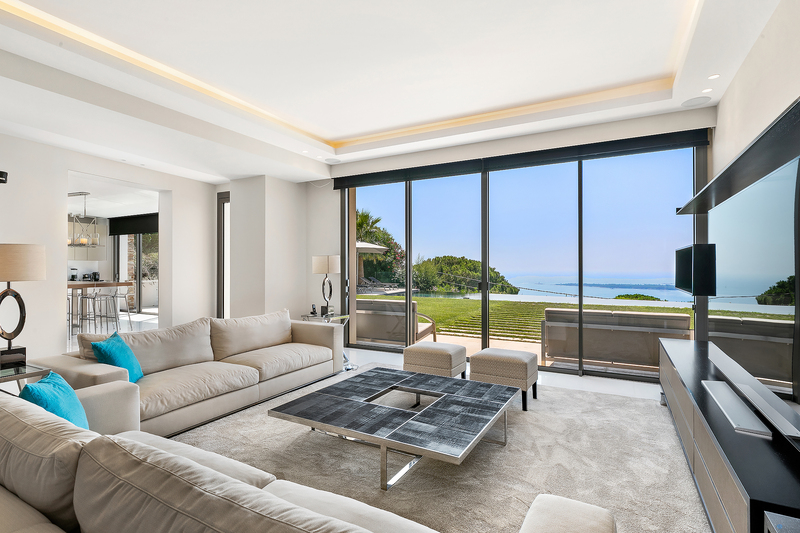 Fabulous pieces of modern art are on display around the room and sliding doors lead onto a sunny terrace with breathtaking views of those memorable Mediterranean sunsets. The lounge area opens directly into a generously-sized dining room. Bright and open thanks to full-length windows all around the room, the dining area can seat 10 people comfortably and is the ideal place to entertain guests in style around the magnificent wooden dining table. The dining room then leads into the villa’s open-plan kitchen. Fully equipped and featuring a large central island for food preparation, you’ll love the stylish light wood cabinetry and chrome fittings in this contemporary space. Serve pre-dinner drinks at the built-in bar area or have a quiet lunch with the family while you enjoy the stunning views over the Bay below. The villa has 5 well-appointed bedrooms which all come with ensuite facilities. The 2 bedrooms on the top floor both open onto private sundecks with elegant modern lounge chairs while the bedrooms on the lower floors have direct access to the terrace or garden. The bedrooms are decorated in the same sophisticated neutral palette as the living space and feature beautiful wooden and chrome accessories. Comfortable and inviting, the villa’s 5 bedrooms offer guests a chic and luxurious space to relax at the end of the day. On the garden floor of the villa, you’ll find the property’s beautiful summer kitchen and living room. The kitchen includes a large dining area for guests and direct access to the garden while the living room has a comfortable seating area and large flat-screen television for guests looking to escape the summer heat. The villa has a private fitness room, sauna and hammam for a relaxing home spa experience. The villa also has a fully-equipped laundry room. The villa is set in grounds of 2000m² overlooking the Bay of Cannes and the Cap d’Antibes. A beautifully-manicured lawn surrounds the property while lush green trees create a feeling of total privacy and calm for the villa’s guests. The rooms on the 2 upper floors of the house open onto sunny terraces or private sundecks while the ground floor offers direct access to a beautiful patio with a lounge area. The villa overlooks a stunning heated infinity pool with breathtaking views over the Mediterranean. The pool features a wooden sundeck with several comfortable loungers, the perfect spot for soaking up the sunshine after your swim.